Gosh, it's been a long time since we brought you Flickr Friday! While we've been slacking, you guys have been making all kinds of great projects with your Pimp Stitch patterns! If you'd like a chance at having your photo featured, make sure to upload your photos to the Pimp Stitch Flickr Group. You can thank Molly at the Purl Bee for another adorable sewing tut! This one is cute and simple and a great first sewing project for children. I just love the photo of her supplies all lined up nice and neat! What are you waiting for? Go make your own! Home Ec Classes at Reform School in L.A.
Hey, it's Amy here. I've been noticing that Reform School in L.A. is offering up some really terrific "Home Ec" classes lately. Case in point, Embroidery 101 with Erika Kern of My Imaginary Boyfriend. It's times like this that make me wish I lived in L.A.! Okay, so there's actually no sewing involved in this tutorial, but it's so cute and simple that I just had to share. These buckets are decorated with children's book illustrations and pom-pom trim. Perfect for storing knick-knacks in a child's room or to fill with Valentine treats! Find out how to make them here. The Purl Bee has a couple of tutorials to get you set for Valentines Day. Check out Molly's Fabric Window Valentine tutorial. And also her Crochet Valentine tutorial. I haven't learned to crochet yet but Molly's instructions make it look super-simple — plus the technique she uses looks very similar to embroidery! I've been a fan of the Meet Me at Mike's blog for awhile now, so you can imagine how excited I was to find out that there will be a Meet Me at Mike's book, coming out in March. From Melbourne’s best loved crafty store comes Meet Me at Mike’s, a cornucopia of crafty fun and inspiration. Queen of Crafters Pip Lincolne has gathered 25 of the best projects from the country’s most creative cleverbods -everything from baby yoga pants and clutch purses to hankies and softies. 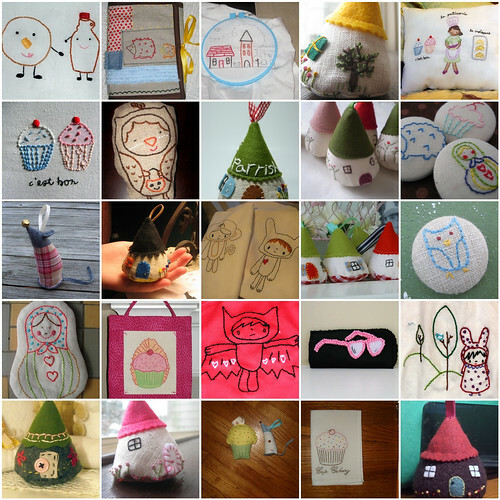 You can sew, knit, crochet, collage and screenprint yourself into a frenzy! Each cute and quirky project comes with easy-to-follow instructions and full-size fold out patterns. With such a fabulous range of ideas, you’ll find something to make for all your favourite pals. If you’re looking for fun and creative things to brighten up everyone’s day, have a peek inside and get crafty! I want it just for the cover design alone! Keep an eye out late March or pre-order it here. Crafting with Cat Hair will be doing a series of Crafting through the 80s posts on her blog, beginning with a tutorial for this must-have Ipod cozy! Check out her tutorial and make your own! Once again, Jenny Ryan at CRAFT alerts us to another sewing project that we just can't pass up! Freda's Hive shares a tutorial on how to make a "Doll House" Potholder. Seriously, how cute are these?? !